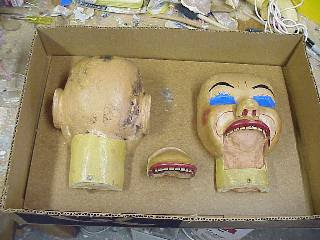 The first step in replicating a ventriloquist figure's head is to prepare the original head for a mold. Any cracks, screwholes, crevices, and other openings must be filled so the mold material does not flow into them and be difficult to remove. Sonny's new head is to look just like the original, flaws and all. Which means the seam separating the front and back will be exposed. Rather than trying to fill that seam with something temporary, I decided to mold the halves separately. 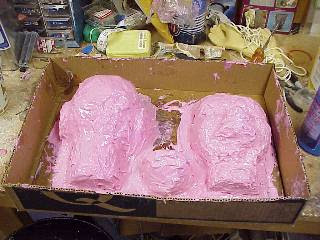 Here are the head halves and the jaw ready for me to pour a mold. I taped the eyeholes over with painters masking tape and filled the jaw hole with modeling clay. I put screws in the screw holes and filled some nail holes with Plastic Wood. Then I poured the mold. Here is the head fully encased in RTV mold-making medium. The next step adds a mother mold to the three pieces before I remove the original head from the molds. That step must wait for the mold medium to completely set up. I'll report more after I've done that.